Camping in Florida is an awesome experience, provided you plan well. A couple years ago I had a longing for a night counting stars beside a fire on the beach, so I invited my family to go camping at Cayo Costa State Park. C-a-m-p-i-n-g? In the "off" season? Resistance would have been prudent but I thought, It'll be ok. After all, there's a sea breeze. Foolish mistake! As a 4th generation Floridian I should have known better, but it had been sooooo long since we'd been camping. Well, I confess it was stupid. 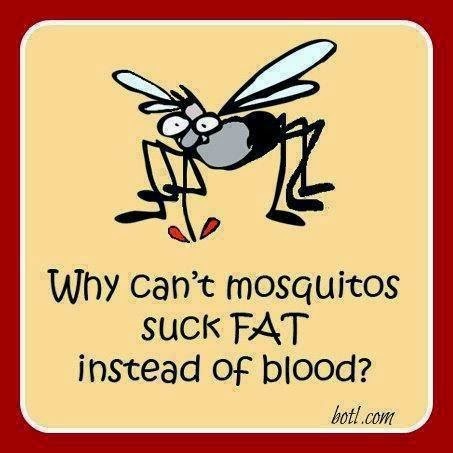 No amount of bug spray and fire smoke would dissuade the little !#&%* biting pests (mosquitos and no-see-ums). We left after one very memorable, miserable night. That's just how it is here in Florida, year in and year out. Remember rule #1 - 50 degrees or less (50 degrees is when the little suckers go into hibernation) and rule #2 - never break rule #1. It will, no doubt, be an eternity before my family stops ribbing me about it. My brothers claim torture. They say, they gave a pint of blood away the hard way. Lesson learned, but it has not stopped me from camping. As long as you plan well and go at the right time of year, it's a whole lot of fun. Camping is a great way to bring people together. The smell of a wood-burning fire while basking in its warmth under an inky blue endless night sky surrounded by the laughter of friends or family is irreplaceable. Stress drifts away and frivolity abounds. Far from the city lights, the brilliant stars are hypnotic. You'll undoubtedly forget what your doing, then laugh when you burn your skewered double marshmallows. You'll probably proclaim, It's just how you like them. S’more, please! Honestly, I love camping but, I hate setting up the tent and sleeping on the ground. That's why I often prefer a cabin. However, some campers say, Pitching a tent is the only true camping. It does allow for a more remote, unique locations. For others, RVs are the only way to go. The comforts of home on wheels. 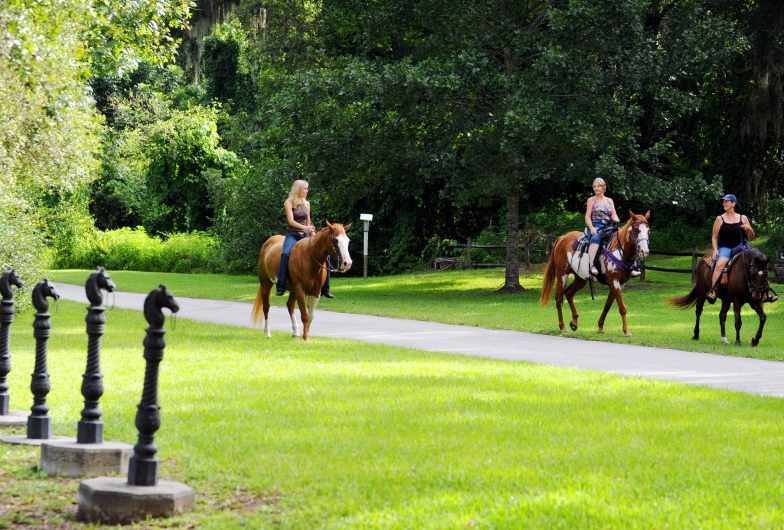 Cabins are available for rent in many Florida State Parks. They are even available in our theme parks, such as, Disney World's Frontier Land where they're not nearly as rustic as they are in natural area parks. I'll admit, camping in a tent these days isn't as primitive as it once was. If you can afford the good stuff, tent camping can be wonderfully modern. Some tents practically set themselves up since camping gear went high tech. Whatever your accommodation preference, choosing the right campground for your adventure is an equally important decision. Whether your goal is chilling out or more active pursuits, it’s important to find the right amenities and activities to suit you and your fellow campers. We once set up camp and the "campers" next to us pulled out a giant TV and plopped it on their picnic table. My thought was, "You've got to be kidding me!" Fortunately for us, they never turned it on or there would have been a park ranger involved! Perhaps, it was my less than subtle chiding. Before you book, contact the park and ask a lot of questions about what you want and what to expect from "neighbor" campers. They may get a lot of local weekenders (in our case college students) that bring everything but the kitchen sink. Know before you go. 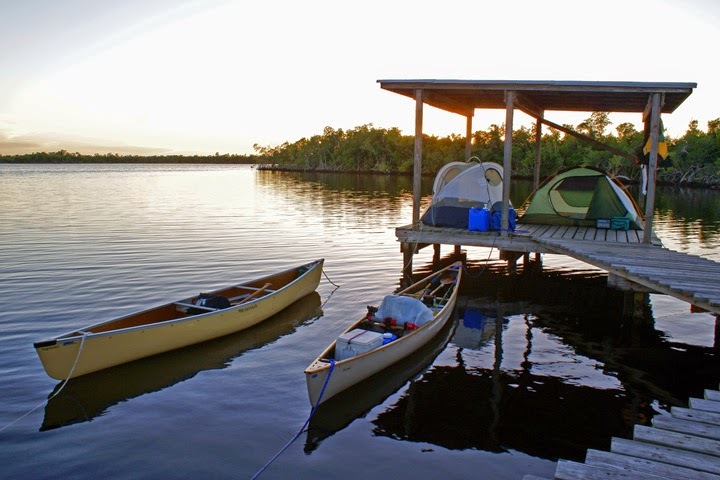 Chickee Camping: In Everglades Nat'l Park (ENP) "Chickees" have become hugely popular. They are located along rivers and bays where dry land is inaccessible. How cool is that? They are elevated 10' x 12' wooden platforms with roofs where you can pitch a free standing tent. Definitely a hard surface to sleep on. Stakes and nails are prohibited, as well as, campfires, but it's well worth the trade off for the stellar location and the paddle in and out access. Imagine waking up to this view with a good cup of coffee and breakfast made on a camp stove. 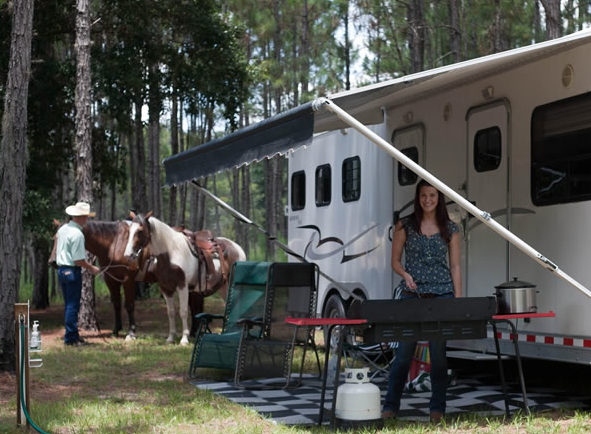 Equestrian Camping: If you’re more interested in horses than in boats or bikes, there are many places in Florida where you can camp with your horse. Very, very cool! These parks are filled with trails for riding. It almost makes me wish I had a horse, but then I remember mucking out the stalls on one or two occasions with my friend Lindy. I don't even like cleaning out the cat litter box. Still, it does look like a wonderful way to go camping. Hmmmm. I wonder if you rent a horse just for the camping trip? 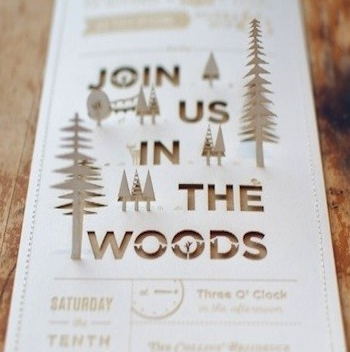 Rustic Wedding: If you are really into camping, and are planning your big day, Ocala National Forest in central Northern Florida has a venue for a camping wedding. If a banquet room is not your cup of tea. Perhaps, whiskey barrels, farm tables, mismatched chairs, mason jars candles and bare rafters strung with lights are your idea of incredibly romantic. 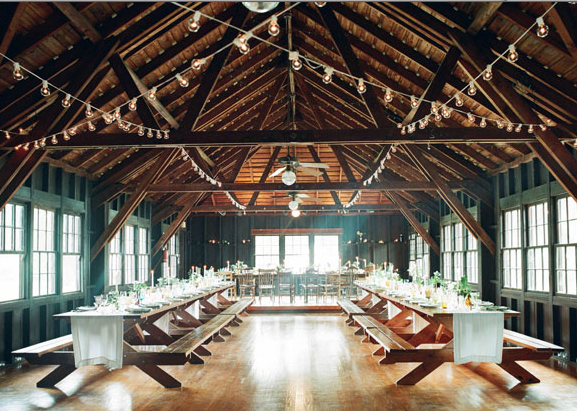 If so, this may be the perfect wedding venue for you. Yours will be the wedding they'll remember. 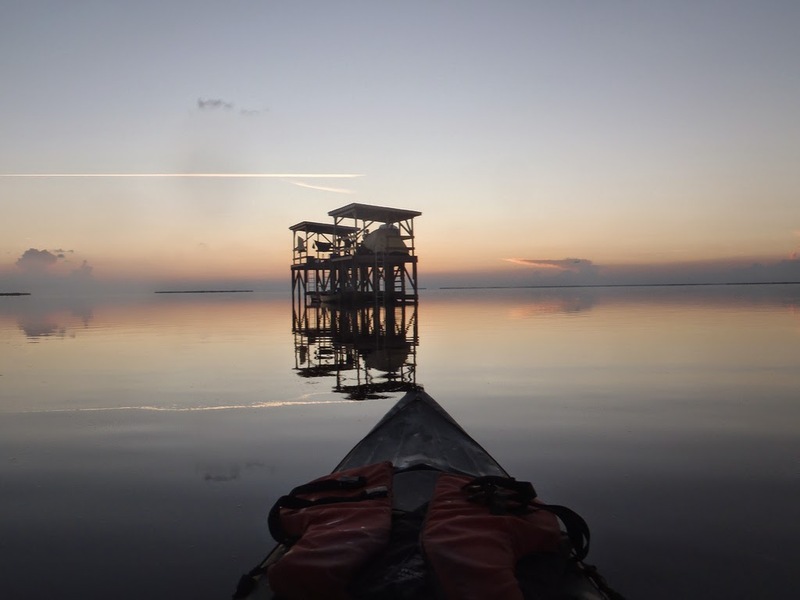 Whatever your reason for going, Florida has many great ways and places to camp. A friend of mine is currently busy with custom essay service on such areas, so I think your post is going to help him a lot. Will forward it to him as soon as I can. The free site for the freecodesmarket is freecodesmarket.com for the online gift cards codes generator for free for the free online purchases for free.